100 layer lasagne. One hundred! 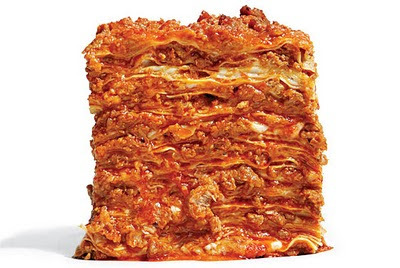 "50 practically transparent sheets of handmade pasta, alternating with 50 layers of sauce (Bolognese, besciamella, and marinara). Each 80-portion pan has to go into the oven by 1:30 P.M. every day. Otherwise, it doesn’t have enough time to cool and coalesce by dinner and completely collapses when you try to slice it. It takes three kitchen stations and many hands to put it together. Skewers hold it in place while it sets. You need a special spatuala to serve it."